BGS middle school students and their families were recently invited to participate in STEAM Night at school. What is STEAM? It is an educational approach to learning that uses Science, Technology, Engineering, the Arts and Mathematics as access points for guiding student inquiry, dialogue, and critical thinking. 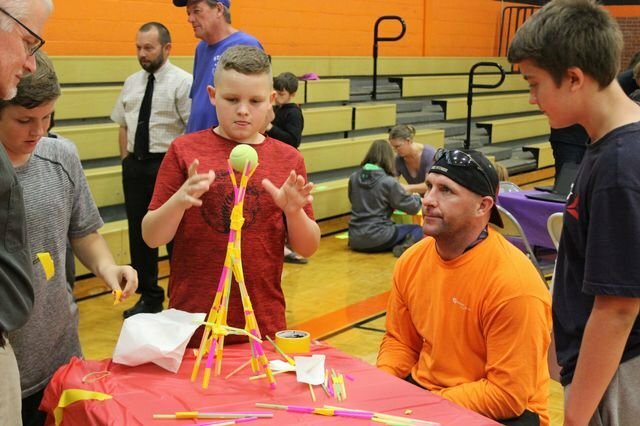 After listening and interacting with guest speaker, Meagan Harr, from Tri-City Aviation, families had fun with various STEAM activities and competitions. There were stations with activities such as rubber band helicopters, cardboard boat races (in kiddie pools! ), mystery bags, art projects, a photo booth, and a demonstration of our 3-D printer. Thank you to everyone who helped and attended STEAM Night! Click here for a video of the photo booth pictures.